I'm two weeks behind on grocery posts because we've been out town. Week 34 was big due to a Costco run. These were a few things I picked in the garden on Monday. Tuesday I went to Costco and spent a whopping $157.92. I bought organic sugar, organic brown rice, organic gluten free flour, organic quinoa, organic tortilla chips, organic flour, organic diced tomatoes, organic hummus, corn dogs, grilled chicken strips, bananas, curry simmer sauce, organic chicken thighs, organic peanut butter, watermelon. I went to QFC Friday for milk & grapes. I didn't want to stock up since we were leaving town. I also bought DD2 a soy yogurt since they were on sale for $1.00. I spent 6.88. 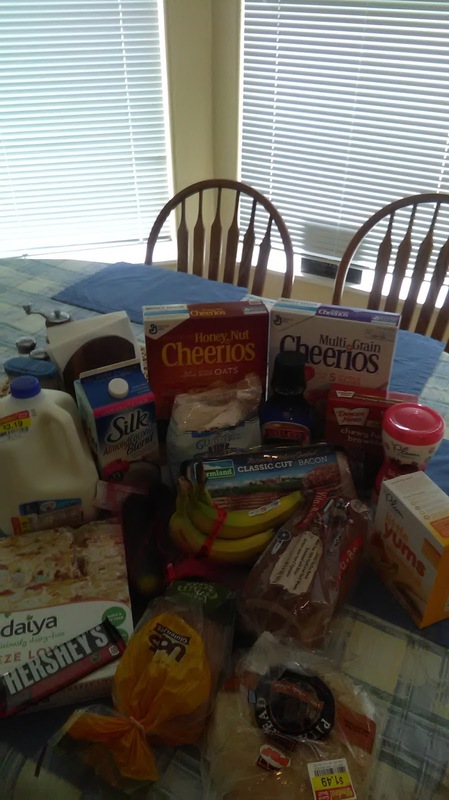 We left town Saturday, but I went to the store early Sunday morning to buy a few things and not eat my parents out of house and home. 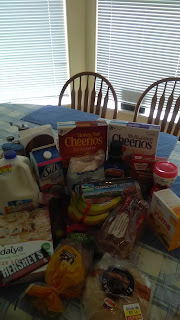 I bought coconut milk, bacon, 2 boxes of cereal, a brownie mix, baby teething biscuits, baby puffs, 2 cucumbers, creamer, a gallon of organic milk, a hershey bar, gluten free flour, pita bread, wheat bread, gluten free bread, bananas & a gf/df pizza for DD2. I spent $50.35.